Previewed at Traffex 2013, this edition of SignPlot is a major breakthrough in speed, accuracy and simplicity. The new ‘wizard’ automates signplot.html pretty much everything about directional signs: panels, patches, symbols, arrows and mileages. But perhaps its cleverest facility is the option to say how wide you want a sign to be – it will then split long destinations and reposition symbols and route numbers to fit, all spaced and positioned correctly to Traffic Signs Manual Chapter 7. Whilst doing all this, SignPlot 3 keeps total compatibility with existing files and retains all the old methods for those who prefer them. 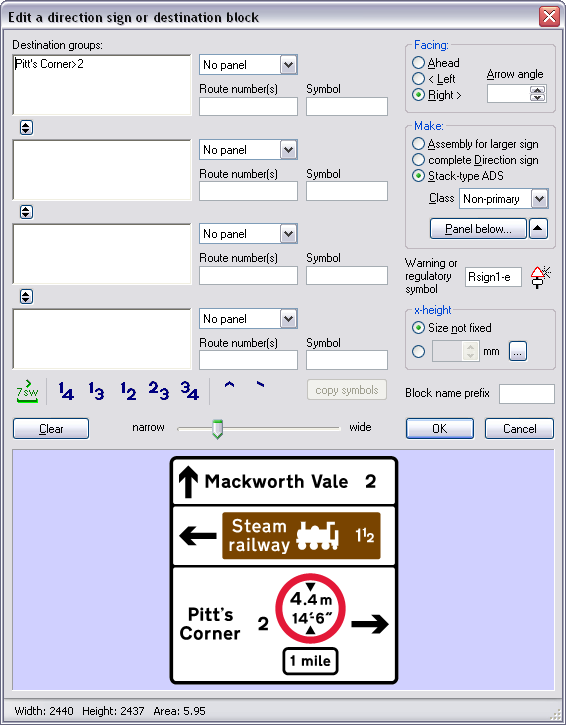 SignPlot 3 automates the Welsh Government working drawings for directional signs and copes fully with ‘bilingual pairs’ of destinations and their spacing. This feature completes SignPlot’s support for the Welsh language on all types of sign: regulatory plates, warning signs and now direction signs. The inbuilt SignLoad Professional now allows edge-mounted flag-type signs and takes from the new May 2013 National Annex to BS EN 12899-1 the appropriate point load (PL1) to use for them.